So the day started off slowly as the plane was delayed by an hour, then when we arrived we were told that all the streets in the center of town were closed off due to a demonstration. Luck changed though as we we entered the center if town, our driver said the demonstration had ended and we could reach our destination of Placa Catalunya. The demonstration had just finished but there were still thousands of people around all dressed in yellow and flying then Catalonia flag. The demonstration had been about Catalonian independence from Spain. I stopped a couple of locals and asked them to tell us what it was all about and they gladly shared their opinions about it. The city is decked out in Catalonia flags everywhere you look. It’s like Israel on Yom Haatzmaut. Anyway, from this point on things ran more smoothly. Our hotel is not gorgeous but it is clean and the location is fantastic. We ate lunch in the area, then we checked into our rooms to freshen up and left for our first adventure. We walked through the streets of Barcelona slowly taking in all the sites. We arrived to Pablo Espanyol and loved walking around seeing the great architecture, watching various artisans at work (we especially enjoyed the glass making), art galleries and tasting various local delicacies. Then we went to our Flamenco show and dinner theatre. The food and performance were a new experience for everyone. We had a 4 course meal with wine, sangria, and water. The menu was local catalonian food and many people were experimenting with their palettes. The two most original things were the strawberry soup and the mint and melon soup. The performance was singing songs with men and women Flamenco dancing. The sounds were so mournful and the movements quite spectacular. The energy level of the troupe was quite high and the audience was appreciative. At one point I looked around to find Gil with his mouth wide open starring at the show and Rachel’s eyes popping out her head. It was really something. 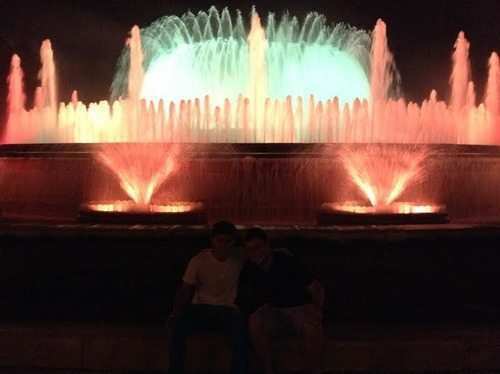 We finished the performance and walked back to a spectacular show at the “Magic Fountain of Montjuic”. The show was set to modern pop music and once again was breathtaking. By the end, people were quite tired, so most of them took a cab back to the hostel, but Natan and I took a leisurely stroll back and got to watch the making of a commercial of a Japanese car company. I asked if we could be extras but they said we didn’t have the right look?!?! When we saw the actors we saw that was true…. They were all Japanese. The students are free now and can go explore our area a bit if they want, but they have all gone to sleep, which is good as we have an early start and long day tomorrow. So, everybody is exhausted. We saw a lot of things today and even hiked a mountain and just to make that even more challenging, it is extremely hot and humid here, but we did it anyway. Barcelona has a great Hop on Hop Off bus system, which takes you on 2 circular routes to all the major sites. 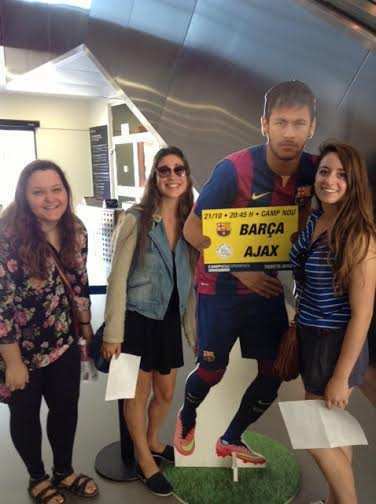 We have a two day pass and will see almost everything that Barcelona has to offer. 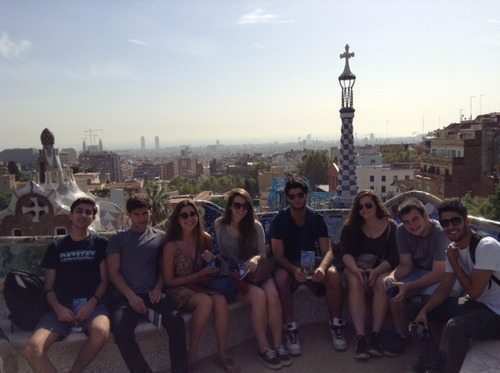 We will stop and visit some of Barcleona’s most famous sites. We started the day seeing a church…this is Europe you know. It was an eerie gothic style church and very different from the kind of Churches you may have visited in the USA. 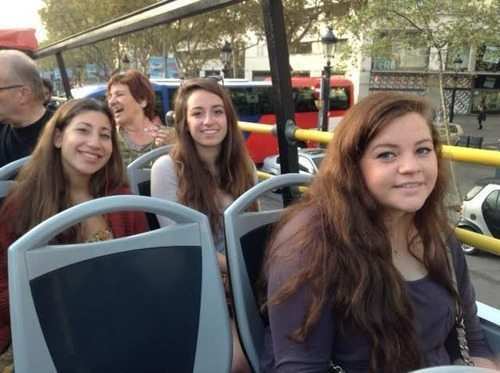 Then we started our bus tour, which takes us to our sites whilst giving us a guided tour of Barcelona on the way. We stopped to see the outside of the Sagrada Familia which Gaudi designed and near where he was accidentally killed before he could finish it. This was definitely one of the weirdest decorated churches, or any type of buildings that any of us have ever seen. 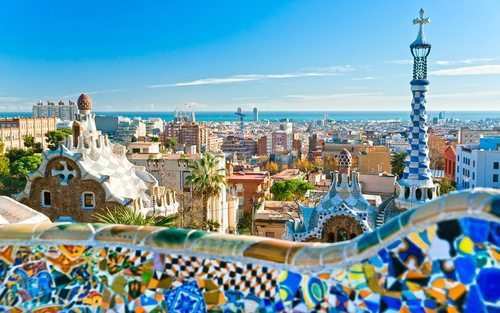 From there we continued to Park Guell, which is the park Gaudi designed and is full of his works. 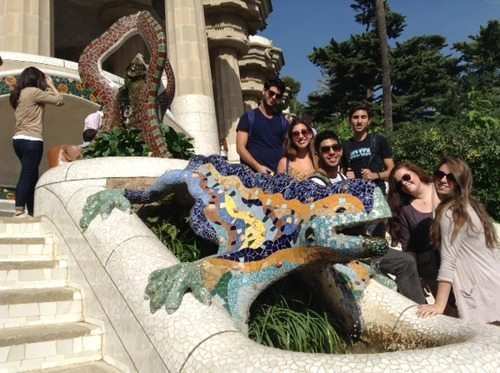 It is pretty big and yet again weird and wacky, although Rachel thinks Gaudi was quite creative and not so strange. I think he was out of his mind! We walked through the public area, full of buskers and street vendors and then we split up and went in different directions to explore the monumental section. The last part we didn’t walk but took a Funicular (a very steep train). 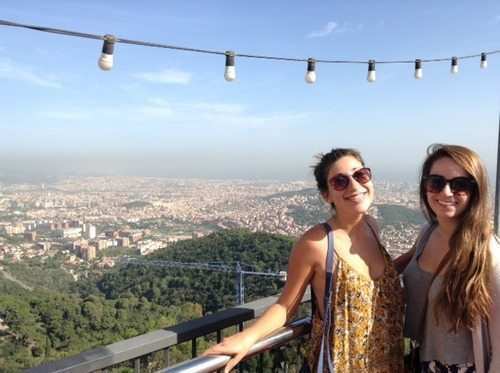 The view of Barcelona was spectacular. Luckily walking down is much easier…thank you gravity and Yarden for convincing me to persuade the group to do walk as opposed to wait for the bus. 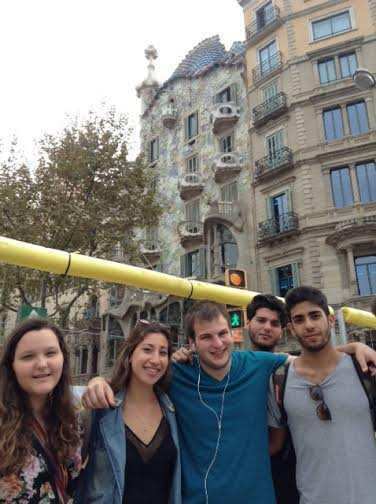 Our final destination was Casa Mila or La Pedrera, a Gaudi apartment block, where he designed the inside and outside. Once again it was weird, wacky, different and very cool. We toured the courtyard, roof, attic and an apartment. it was fascinating and I think Sam really enjoyed himself, even asking me to repeat one of the explanations on the audio guide that I skipped the end of. 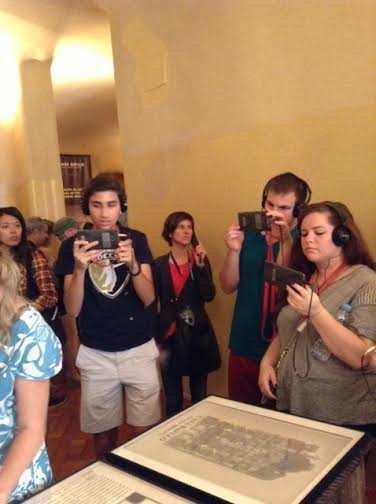 ( I controlled the audio guides for the group and thus the pace we moved at.) 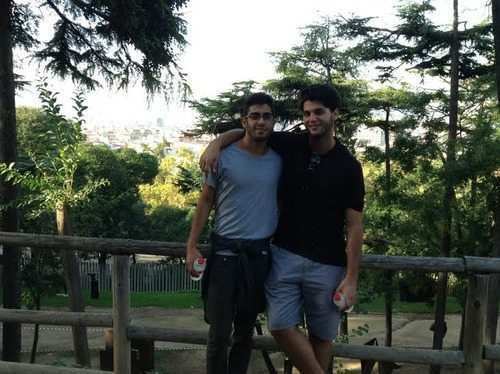 We then had some free time in the center of the new town of Barcelona. 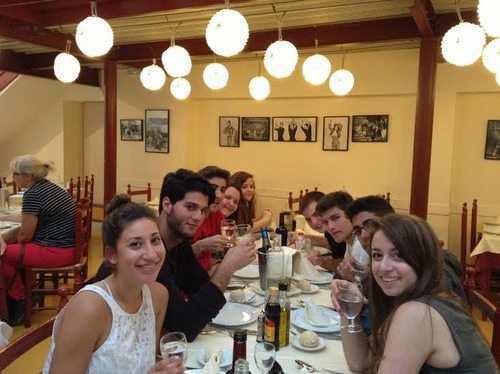 We then grabbed dinner in a Tapas restaurant, which was rather filling and then headed on to the home of one of our graduates from the program last year – Gisela Des. Gisela’s mother, Feun served us even more food when we got there. She then took out a map and showed us where her family grew up and talked about the history of the Jews in Spain. We also learned about the “marranos” – the secret Jews, of which Gisela’s mother discovered she was a part of. I asked how and she said the first clue was the family name. The “Crypto-Jews” often had special names so they knew who they were. Her name was Alkalay. There were other clues as well. For example, in her family there was a concept of ‘Saturday Cleaning’ which they used as an expression of things that were special or had to get done. All in all this is the kind of experience that you don’t get as a regular tourist and what makes the Aardvark trips not only about fun but also about education. The evening was very pleasant and after we finished, we strolled home, except for David who flamenco danced most of his way home. In fact, since yesterday, we’d often be walking and then someone would start clapping and tapping their feet- David! Now students have some free time and some have gone to sleep, whilst others have gone out to explore some of the nightlife in our area. I let the students have a later wake up today and then we were back to our Hop On Hop Off bus tour. We drove the West route this time through Mountjuic -“Hill of the Jews”, named after the Jewish cemetery that has been there for many years. We drove through the stunning Miramar gardens and saw all the Olympic venues from the Barcelona Olympics. In between, we visited the Miro Museum. Miro was a major and influential painter who was from Barcelona. The museum is of contemporary art and his later work is often described as abstract. We can’t say we loved the art but it definitely was different and made you think. We watched a film which explained his life and art and then walked through the gallery which showed how his art changed over the decades into the signature Miro style that has become so famous. there was also one special exhibit dedicated to his public works all over Barcelona, many of which we have seen over the last few days. 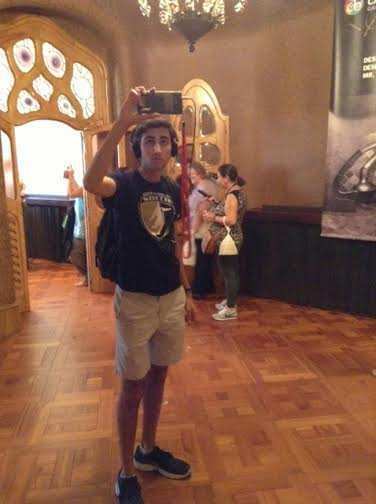 At the end of the museum, Ben said that he had ‘thoroughly enjoyed every minute of it’, he also admitted that the weird trippy music he was listening too helped enhance his experience. 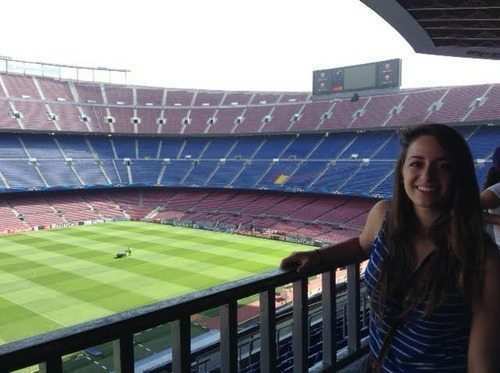 Then we continued onto the Nou Camp Stadium – home to Barcelona Football (Soccer Club) and the largest stadium in Europe. We visited the museum to soak up some of the history of this famous club and get in the mood for tonight’s game. They just have so many trophies and famous players. 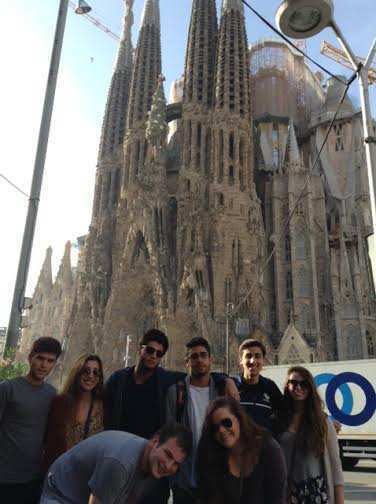 Then is was time for lunch and some shopping in a mall, before heading onto our final Gaudi building – Casa Battlo. This building is a private residence, designed inside and out by Gaudi, but we were able to tour one apartment, the stairwell, attic and roof. This time we had an audio-visual guide, which made the experience even more surreal. 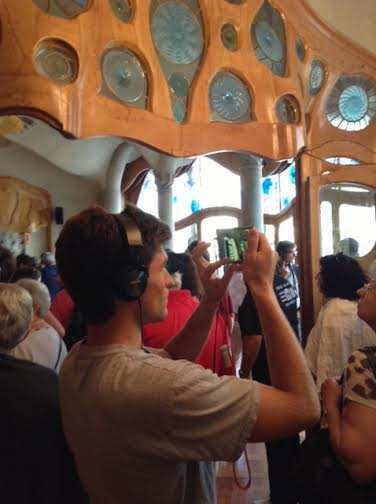 We each had handsets, which when you held up in different directions of the room it either showed you how it would have been set up when the building was first inhabited or what was going on in Gaudi’s mind when he designed certain aspects. I will send you some pictures of us in the experience, including one of my handset, so you can see what I saw on the screen and what was actually in front of me. Everyone agreed this was very cool. We then had a bit more free time in the town center and grabbed some dinner in the Kosher restaurant on La Ramblas, before heading back to the Nou Camp to see Barcelona FC against Ajax Amsterdam FC in the Champions League (which is Europe’s no.1 soccer competition, between all the best teams from each country in Europe). It was quite a performance by Barcelona who were 3-1 winners. Barcelona looked like they would score every time they got the ball and both Abby and I were filming every opportunity they got, but neither of us got an actual goal, partly because in order to miss the crowds, we left 2 minutes before full-time (the students idea) and missed the last 2 goals. It was a very memorable experience! We did make it home with relative ease on the train and now it is bed time, so that we can recharge our batteries for tomorrow. This morning we got up early to catch our tour bus to Girona. For those who stayed awake, it was a beautiful drive through the Catalonian countryside, with rivers, streams, rolling hills, forests and hill-top castles. 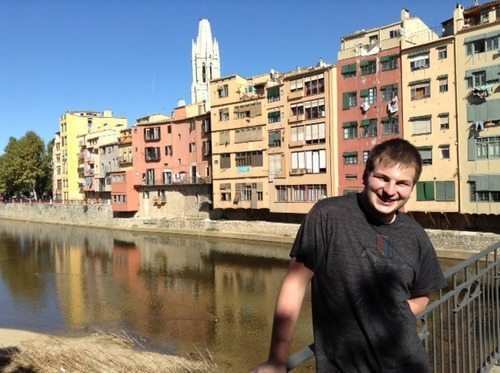 Girona was a former Roman town that was prominent later in the Middle Ages as a major trade center and had a sizable Jewish community until the Inquisition. 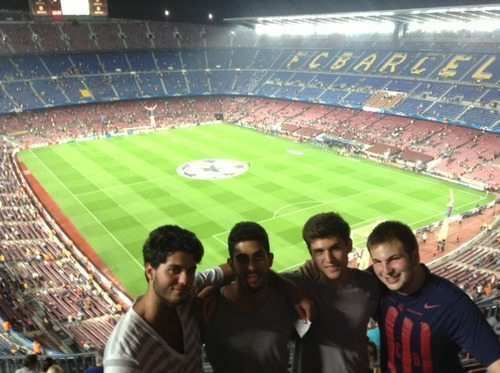 We had an Israeli Tour guide, Adi, who will also be with us tomorrow on our Jewish Tour of Barcelona. The town was quite picturesque. Whilst learning about the Jewish History of the town, we heard that the Jews survived the Black Plague in the mid 14th Century but the Christians didn’t, so the Jews were blamed. This increased anti-Semitism led to yet more “Crypto-Jews” (Secret Jews). We also heard about the Jewish ritual practices that led to more germ control like washing hands before meals, kashering meat, not mixing milk and meat. Next it was my turn. 9 years ago I started the Shabbat afternoon shiur in my shul and each year we choose a different commentator to study the weekly Torah portion together. 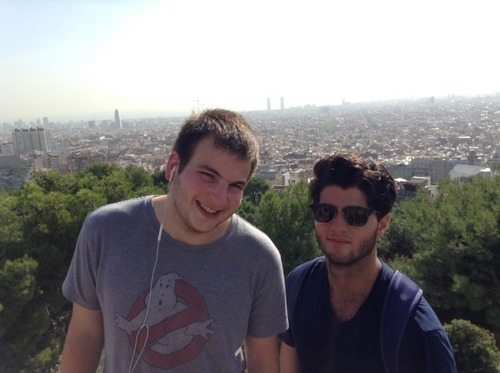 That first year we chose Ramban and his views at the time excited me and now here we were, in the town in which he lived and I had an opportunity to lead a Limmud about him. Ramban was a very famous Jewish commentator with some interesting views on Israel. He believed all mitzvot practiced in the Diaspora were not worth anything, but were just practice for when we return to Israel and they do count. He also believed, living in Israel to be one of the 613 Mitzvot (which not all commentators believe) and equal to all other mitzvot together. He also believed purchasing land in Israel is a mitzvah and eating the produce that the land produces during shmita year, which we are currently in. He lived up to his ideals, moving to Israel in the mid 13th Century (aged 73) and settling in Jerusalem, founding both a synagogue and Yeshiva and through his students spread Judaism throughout Eretz Yisrael (the Land of Israel). 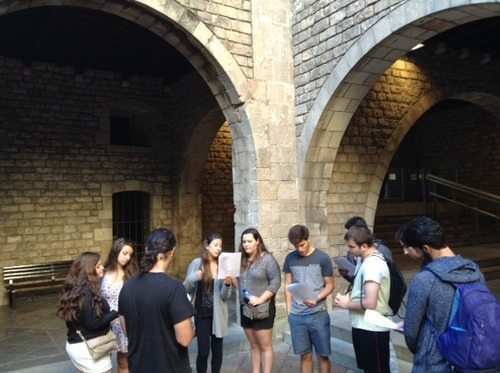 The Limmud, which took place in the middle of the Old Jewish Quarter (you’ll see in the pictures), allowed us to link this Rabbi from Girona almost a thousand years ago, with modern day issues in Israel. We discussed Shmita, the Haredim, Israeli politics, the first and second Aliyah, modern day Aliyah and Yerida – all based on commentaries written on the Torah a few steps from where we were sitting. I am biased, but I think that is pretty cool. After our tour of the Jewish quarter, we visited the Jewish museum, which had remnants of an old Jewish house and very old gravestones, which had subsequently been used for other things, the most disturbing of which we found to be an aquarium. (You may be able to notice this in the pictures). We talked about the Golden Age of Spain and the Expulsion and saw artifacts from all these time periods. Then it was time for lunch in the square of Girona and here we learnt about the Spanish laid back attitude…….. As we waited forever for our food. Then it was off to Figueres and the Dali Museum. That museum is reason enough to come to this part of the world. It is spectacular. We spent some time together with our guide, enjoying Dali’s brilliance and madness and then the students could explore by themselves. Abby and Kira stayed in the longest. Abby couldn’t even find words to describe the place and Kira thought it was “funky”. Kira seems to be our most into art, of all the students. Then the students had some free time to explore the cute town. You should google Dali and look up Dali and Israel. 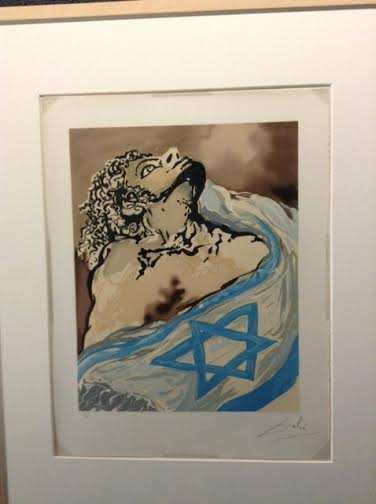 In the museum we saw a fascinating series of art he developed in 1968 called Aliyah where he has some very powerful works regarding the Holocaust and the creation of the State of Israel. I’ll send some pictures for you to see. Whilst we were in the museum, we talked about his relationship with Israel and the Jewish people. 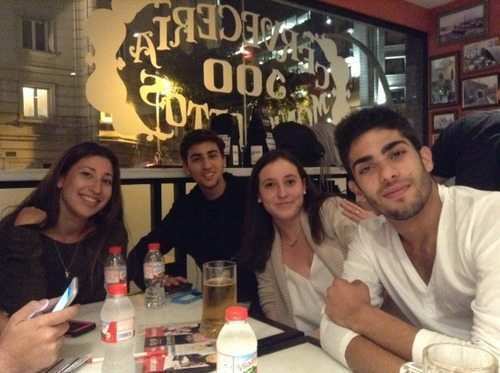 We then returned to Barcelona and met up with Gisela and some of her friends for dinner. 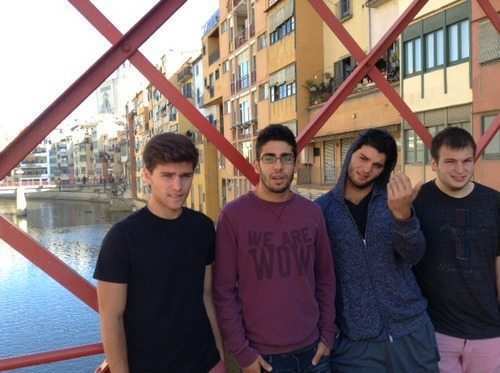 They are all Jewish students and it was an interesting mifgash (encounter) between our students and these Spanish Jewish students. 4 of them came in total, including the Rabbis son. 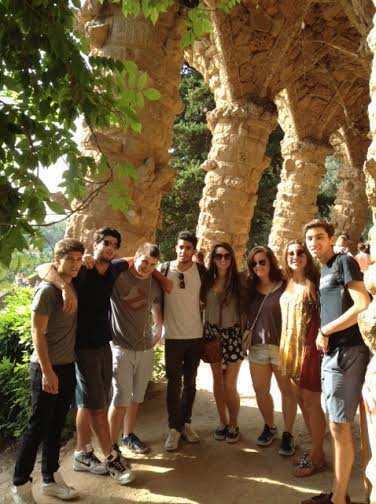 We challenged them with some questions about Jewish life in Barcelona and their future. At least 3 said they don’t see their long term future there and 2 said they wanted to end up in Israel. When I left them together after an hour and a half, I told our students they had free time and were welcome to hang out with the other students. I’ll find out tomorrow if they actually hung out together. 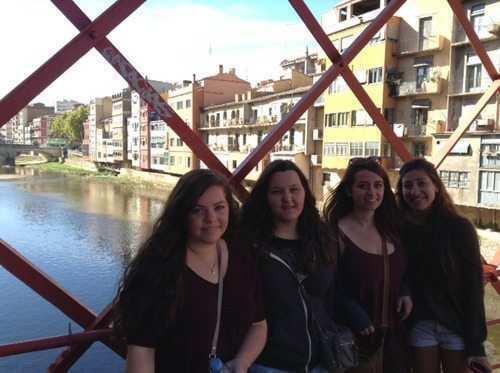 I didn’t want to cramp anyone’s styles…..
Today was our last day in Barcelona. Our Guide from yesterday, Adi, picked us up from our hotel and we started our walking tour of the ancient Jewish Quarter of Barcelona. 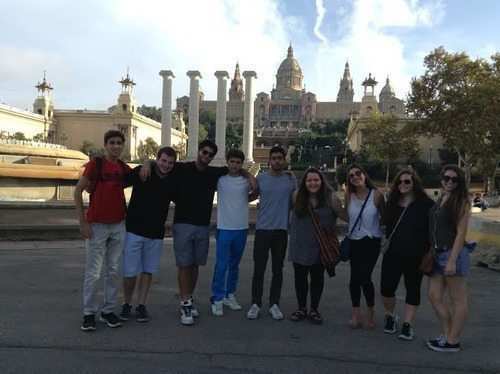 We talked about the Golden Age of Spain and focused on some specific individuals who were from Barcelona, most notably, Shlomo ben Aderet, the “Rashba”, a medieval Rabbi, Halachic scholar, and Talmudist who was born in Barcelona and was a leader of Spanish Jewry in his time. 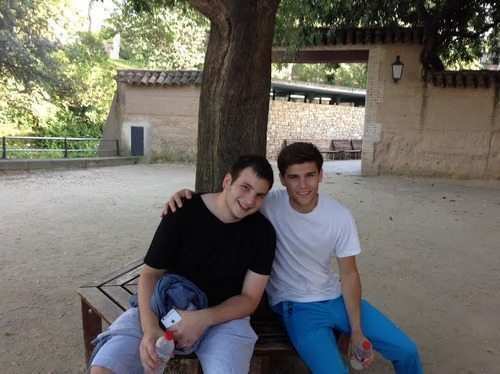 We talked again about the Ramban and the Barcelona disputation, which eventually led to his decision to leave Spain and move to Israel. We also visited Sinagoga Major, said to be the oldest synagogue in Europe. Many of us were used to visiting old shuls in Poland, but this was really nothing like that experience. It was more like entering a small cave and seeing remnants of what once was. We saw jewish gravestones from montjuic, used as building bricks in the royal palace and places were mezzuzot once were. 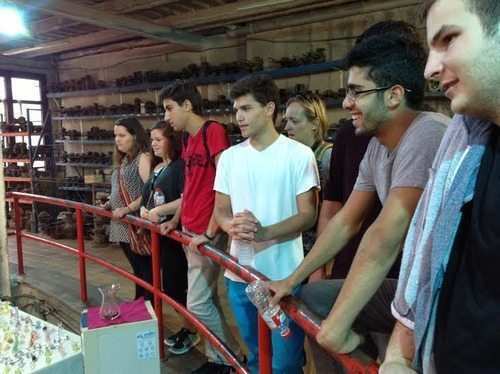 What was great about having an Israeli tour guide was that he was able to link in the tour to other periods in Jewish history and the places they are visiting on their field trips in Israel this year, plus other International trips. The biggest surprise of all was when he insisted we walk into a store and walk all the way to the back of it, where we were suddenly greeted with the site of an ancient mikveh. It was totally unexpected and pretty cool. They only found it recently, when the store tried to expand. Along the route, we also stopped at the house of the Inquistion. Here we held a short Tekkes (Ceremony), to remember those people who died for refusing to give up their Judaism. We then grabbed a bite to eat and took the train down to the Olympic Port. Here we had some time on the beach, because yet again, we had beautiful weather. 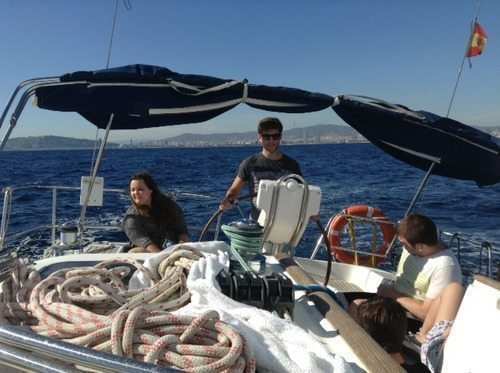 Then we headed out on a private sailing boat for a Marina tour of Barcelona and the Mediterranean coast. It was a very relaxing couple of hours after a packed and hectic week. Natan was the first to take a quick lesson and then drive the boat, and then he taught Yarden. Kira also got in on the act and steered the boat home at the end of the trip. 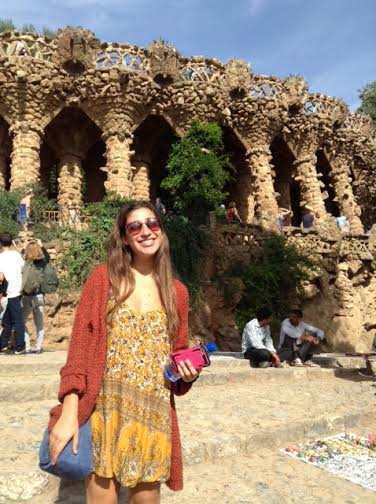 When we got back, we strolled along the beach front and got some ice cream, before zigzagging our way back to the area of our hotel, through Barcelona and El Born neighborhoods, two very different and atmospheric places. Students had the option to go to the Picasso museum before dinner but preferred some down time instead. I went and there was a big queue. I asked a staff member if it was worth the wait and he said no, which was definitive enough for me, if there own staff don’t think it’s worth the wait. Soon we are meeting up for dinner again. 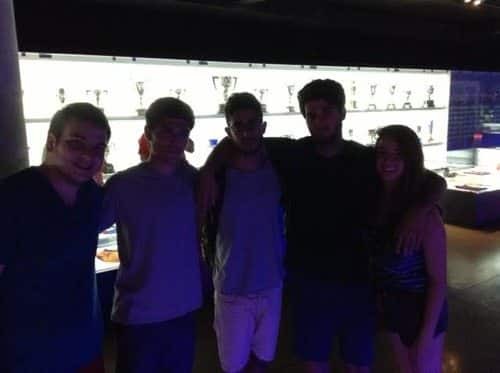 We are going back to the Maccabi kosher restaurant, as its nearby and we all had an excellent experience there and then we are on our way to the airport. This blog was written by Simon Cohen.